Berkshire Hathaway, the firm controlled by mega-investor Warren Buffett, owned approximately 246.5 million shares of Apple as of the end of June, a slight increase from three months prior, according to a 10-Q filing with the Securities and Exchange Commission, and cited by Business Insider.. The shares valued the company's Apple stake at just under $50 billion as of June 30, but Apple's stock is trading at $209.25 a share as of Tuesday morning. That means Berkshire's stake, if they still own the same number of shares today, is now worth over $51.5 billion. Apple, since February, has been the most valuable company in Berkshire's portfolio. Berkshire Hathaway remains Apple's third-largest shareholder, behind only Vanguard and BlackRock. "I would love to own 100 percent"
Throughout April, Apple's stock was taking a beating based on analyst speculation about soft iPhone demand. But two events in early May helped calm investors' nerves. First, the company announced better-than-expected second quarter earnings. And then, Buffett disclosed that he had upped his stake in Apple. 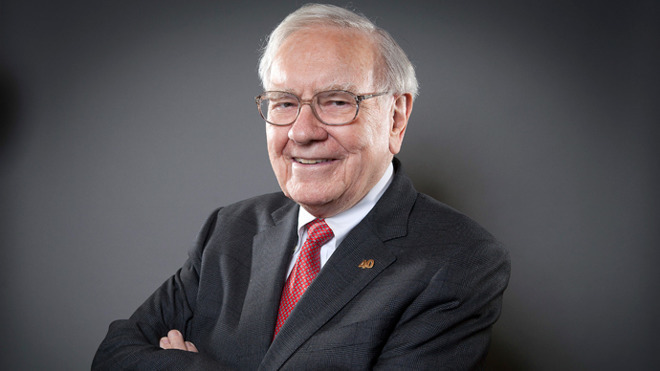 On May 3, Buffett announced that Berkshire had bought 75 million shares in the first quarter of the year. Buffett had never invested in Apple until 2016, but his company has gradually bought more and more of Apple's stock throughout the last two years. In February, after one such purchase, Buffett praised the iPhone and "sticky," and confirmed that Berkshire had bought more of Apple in 2017 than any other company. Following the big Q1 purchase, Buffett discussed his Apple strategy in a CNBC interview, in which he famously said he'd love to own 100 percent of Apple. "We're not buying a stock when we buy Apple, in our minds," Buffett said. "We're buying 5 percent of a business. We buy 100 percent of some businesses, and when they're publicly held we buy 5 percent, but we bring the same thinking to it. We like very much the economics of their activities. And we like very much their management, and the way they think, and the way they act." Buffett's stake is now up to about 5.1 percent of Apple's shares, according to the SEC filing. Apple's stock has continued to rise in the months since Buffett's big purchase, hitting a pair of milestones last week. The stock hit the $200 mark on August 1, and the following day Apple became the first company in history to reach a trillion-dollar valuation.